Charming horse property in the desirable equestrian neighborhood of Hangen Ranch. Convenient One level-living! Fall in love with the 360Â° mountain views, expansive windows, spacious patio & open floorplan. Home features knotty pine cabinetry for a rustic feel. Bonus office/flex/nook next to the kitchen. Formal dining room & family room with a wood burning stove to keep you warm on chilly days. Retire to your private master bedroom with a walk-in closet, attached bath, knotty pine & vaulted ceiling. 3 more beds, one w/attached 1/2 bath. Enjoy the spacious back patio or the covered front porch. Watch deer, elk & fox play on over 2.6 acres of land with a circle driveway, RV parking, loafing shed, 2 car garage with a hayloft above that has been converted into a rec room, workshop/tack room, and a storage shed round out this property. 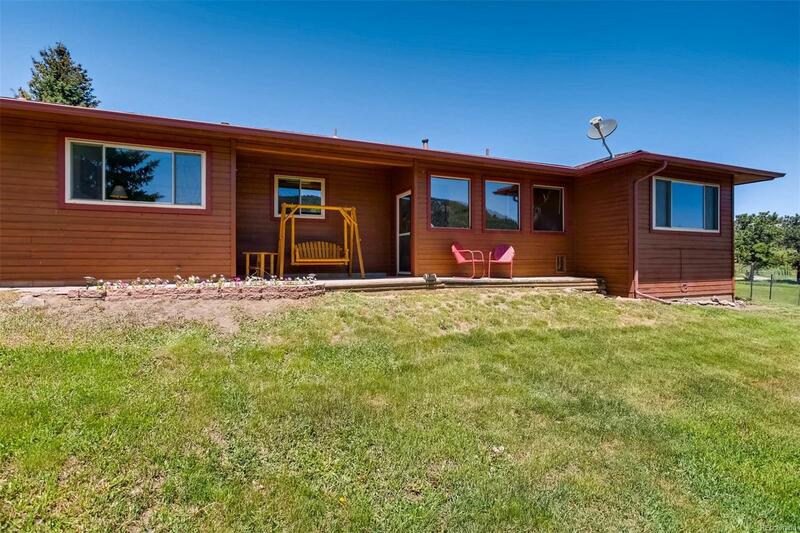 Conveniently located near hiking, fishing, & easy commute to Denver or skiing. Don't Wait! Make your move & start enjoying the mountain lifestyle now!